This page contains information and links to sites for DIY folks in autorepair and home improvement. This page is forever changing - I am in the process of building content and am nowhere near completion. I do have a real job and will be working on these pages during the evenings after I mow the lawn, fix leaky faucets, repair the VCR and do other more mundane things that a homeowner needs to do. It will get done quicker if someone wants to come over and do my homeowner work!! Check back once a week for more information as I add to it. Enjoy . . . . . Here you will be able to acquire knowledge gained over 50 years of working, tinkering, finding shortcuts to fixing just about anything in your domain. As a graduate mechanical engineer Brother Bob gained an insight into the workings of just about anything he works on. His motto is "If someone else can fix it, why can't I? Knowledge is my only barrier" As a result, he has attacked anything from television sets to air conditioners, automobiles to farm tractors, toasters to refrigerators and much more. His shop would make any professional repair person proud although another Brother Bob motto is "A clean workbench is the sign of a sick mind!" One of Bob's pet peeves is to start a job and find out that he doesn't have the tools to work efficiently. As a result he has acquired electronic equipment, wood working tools (both power and hand tools), a 12 drawer mechanics tool box and a host of other tools that he has found through out the years makes life a lot easier. Throughout these pages of tips, Bob will suggest a minimum set of tools needed to fix the item under discussion. He offers suggestions as to who makes the best tool of the type being used and what you can get away with if you don't want to invest heavily in a large inventory of tools. There is yet another function of these pages, that of offering information (break down that knowledge barrier) to the home owner or car owner as to just what can go wrong with something - what generally breaks. Bob offers you a wide range of knowledge so that, even if you are not willing to attempt to repair something yourself, at least you will be informed as to what a certain set of symptoms indicate is broken. With this knowledge in hand you will be able to go to a repair shop prepared to encounter even the shadiest of repair persons (not that all repair persons are shady, but a bunch of them are and you are likely to encounter one sometime in your lifetime). Did you ever go into a repair shop where the owner told you that you needed an expensive repair and you didn't have the foggiest notion as to what he was talking about?? Your first reaction is to tell him to go ahead and do whatever needs to be done (after all, who are you to question HIS wisdom??). You don't have to feel like that any more. Bob will give you a list of questions you can ask when confronted statements like, "Looks like you need a new muffler bearing!!" When Joe the repairman sees that you are knowledgable about the symptoms and the diagnostic procedures that he should have performed before selling you something you don't need you are much less likely to get the proverbial shaft. If only one of my neighbors had that kind of information he could have saved over 400 dollars getting his "dead battery" problem solved. Sooooo, start browsing through the links you will find here and on other linked pages. I think you will find some valuable information here, and best of all it's all FREE!! By the way, if you don't find what you are looking for here just ask me and I'll consider writing a page on your problem so that others might find additional information to help them solve their problems. Dehumidifier story - will a dehumidifier make a hot and humid bedroom more comfortable to sleep in?? My dehumidifier coils freeze up - how come?? Another fix for frosting up dehumidifier coils. Here's a story from a reader who had a problem with the fuse blowing on his electric clothes dryer. Electric dryer acting up? Got heat when it is asking for air only? Here's a story from a reader who found out why. An electric dryer (Maytag) overheats. Here's a solution. Heres a unique solution to a clothes dryer that wouldn't. A reader finds a problem with some GE Washing Machines and their motors prematurely failing. Here's a link to a good on-line appliance parts supplier who offers some free diagnosis of problems with your major appliances. This lady's washing machine was shaking so violently it walked across the room! You point the remote at the TV and push the button and nothing happens. Here is a neat trick to see if your remote control is working. I want to put an old refrigerator in my garage. Will it work out there in the winter? Electrical power distribution description. What's hot . . Ground Fault Interrupters - GFIs - What are they?? Service manuals for your electronic stuff. Get them on CD for a reasonable price! Drop me a line and I'll see if I can get them for you. GARDENING TOOLS - This section is under development. It will contain recommendations for gardening tools that I have personally used and tested. I gather useful gardening tools from all over the world and will be featuring them on this page for your information. It will include current prices and locations for purchasing the tools. Here's a way to repair a broken handrail pipe for a concrete breakwall. If you live on the water and have a breakwall with a floating dock attached this will be of interest to you. Even if you don't live on the water you may enjoy this story. Flooded basements cause immediate damage but there is a danger lurking if you pump the basement out too soon. Ink and toner can be expensive unless you shop here. Garage doors can get out of whack with age and may need adjustment or repair. Here is a story about the garage doors on my barn that suddenly became hard to open and close. Want to know the cost of heating your house or business go here and enter the various fuel costs for your area. Baseboard Hot Water Heating systems description. Tired of hearing that annoying squeak when the furnace blower starts up? Read this article to see how to fix it in less than an hour. Water bill too high? Check this out to see where the water might be going! 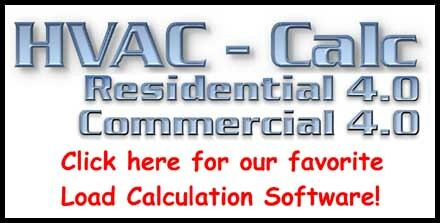 Take a look here if you want to do some serious calculations of how much insulation you will need to satisfy your heating and cooling needs for your home or commercial installation. Also use it to size your new furnace or air conditioner! There is a 30 day free trial version that will demonstrate to you just how cool (no pun intended) this program is! Just click on the image below. Need to test the hardness of your water? Go here. A fast fix for an old problem. Who Flushed?? Trying to solder copper pipes? No Sweat!! Dirty water at the faucet? Try a whole house filter system. For a follow up letter from a reader about sweat soldering go here. Water heaters just sit there year after year doing their thing - until they fail!! The water just sits there in the tub. You plunge it, pour chemicals down the drain, but it just sits there, cold and gray and full of Draino and soap scum. Now what?? Roto Rooter? Dynamite? There is a simpler solution to most clogged bath tub drains - TubDrain. Toilet making that funny hissing sound? Go here to find out why. I thought I was doing well covering plumbing questions and answers until I found this site. Check it out for an extersive amount of information on plumbing. Black and decker's wonderful parts department! Battery operated power tools often require new batteries. Go here to find the right one for your power tool. You are visitor number out of a possible 932,232,895 so tell all your friends about the good stuff you find here and come back soon!!! CAN'T FIND EXACTLY WHAT YOU ARE LOOKING FOR ON MY AUTO REPAIR WEBSITE?? USE THIS CUSTOMIZED SEARCH TOOL TO SEARCH FOR KEY WORDS ON MY WEBSITE!! Reckon you can clean your own hard disk? Deleting "Internet Cache and History" will NOT protect you. Formatting a disk does NOT delete the contents. Pressing Delete does NOT delete pictures. Everything you EVER DID is STILL STORED IN YOUR PC.